Successfully Added Ulefone Be Touch 3 4G Smartphone - 5.5 Inch FHD 2.5D Arc Screen, Android 5.1, 3GB RAM, Octa Core CPU, Sony Camera (Grey) to your Shopping Cart. Now only at Chinavasion, FREE tempered glass screen protector! Value: 9.99 USD. Ulefone fans will be pleased to see that the Be Touch flagship phone is back with a 3rd generation offering in the form of the Be Touch 3 which sets a new benchmark for sub $200 smartphones phones. They have kept that beautiful form based on a metallic frame and the exterior of the phone is essential unchanged however the tweaks to the software and performance make this new flagship phone a real beast. The new Be Touch 3 sports an Octa Core MTK6753 processor under the hood and Mali T720 GPU which when paid with the 3GB of RAM bring a performance that scores super high on benchmark tests. The makes the phone a masterful companion for gaming, multi tasking and heavy usage. With a 5.5 inch IPS screen you can enjoy all the fun in full HD 1080p. The IPS screen is protected by Corning Gorilla Glass 3 and has a 2.5D arc allowing it to flaunt colorful crisp images across a wide 178 degree viewing angle. Ulefone have tweaked the Android 5.1 OS to bring even greater battery usage and optimized power consumption so you get up to 6 hours of continuous talk time or almost 300 hours in standby from the powerful 2550mAh Sony battery. This lithium ion battery is rarely seen in phones under $200 but has the huge advantage of quick charge technology so can achieve a 35% charge in just 15 minutes. 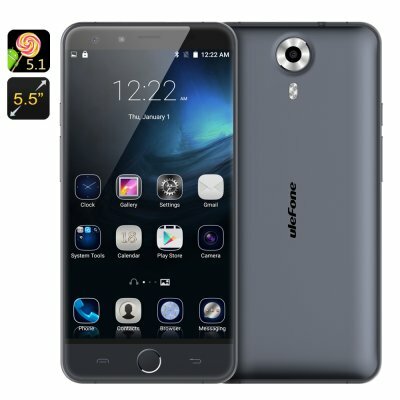 The Ulefone Be Touch 3 has two SIM card slots and supports 2G 3G as well as 4G bandwidths, this brings the fasted cellular connectivity letting you look forward to 150Gbps data transfer and steam HD movies direct to your large screen phone. The Be Touch 3 from Ulefone comes with a 12 months warranty, brought to you by the leader in electronic devices as well as wholesale Android Smartphones..